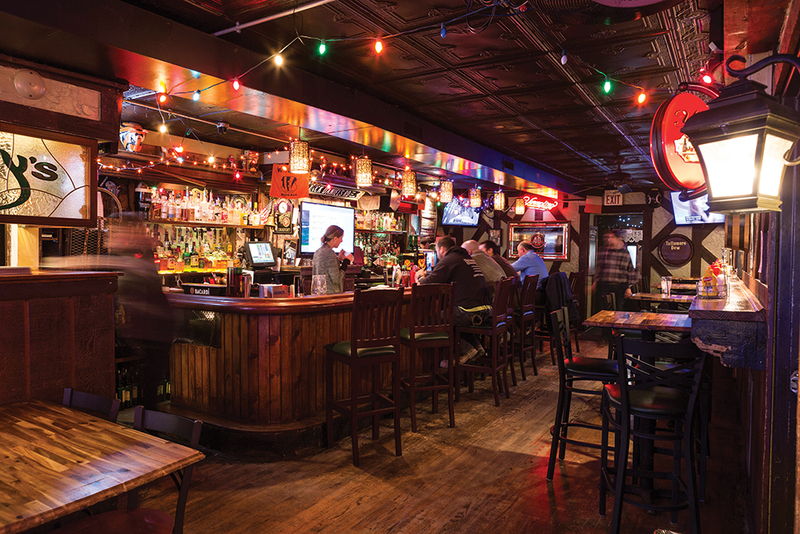 →When they say O’Malley’s has been there forever, they’re not kidding. With aliases like Ogden’s Place and The Hideaway, there’s been a bar wedged there in the block bounded by Third, Fourth, Race, and Vine since 1892. Noted as the second-oldest bar in town (after Arnold’s), historically, it’s that little, out-of-the-way place where nobody goes. Except those looking for a hard-to-find joint where you can duck out of work early and hide from the boss. Or clandestinely meet that certain suspicious someone. Or just grab a Guinness incognito. Come to think of it, with so many of life’s refugees hanging out here, it explains why O’Malley’s has gotten so busy. I can’t say you’re going to be wowed by the menu at O’Malley’s. It’s bar fare, but often with signature twists that have some patrons lunching here daily. Let me give you a couple examples, like the fish sandwich: beer-battered cod with tartar sauce, but they add tomato, cheese, and serve it on marbled rye. Or the Buffalo Tender’wich: chicken tenders tossed in buffalo sauce, but with bacon, Swiss, cheddar, and a douse of ranch dressing, all stuffed into an oversized bun. They’ve got all the other bar faves too, but it needs to go on the record that this is the one place downtown you can get a three-cheese grilled cheese sandwich and homemade tomato soup every day of the week. O’Malley’s is part of that building that morphs into the Blind Pig and Coffee at Lola’s, but it’s still its own little hole-in-the-wall, with that antique pressed-tin ceiling. It’s even attracting people who aren’t looking to not be seen. To paraphrase Yogi Berra: That place is so crowded now nobody goes there anymore. Previous articleIs MLB Killing Our Beloved Baseball Holiday?